And my friend LaMar also submitted his own design which is awesome. It was just a little bit late so we didn’t get to include it in the entire roster but I finally got around to doing it now so here it is for you to enjoy. This design would make for an excellent backyard guest house, off-grid cabin, or even office. What would you use it for? 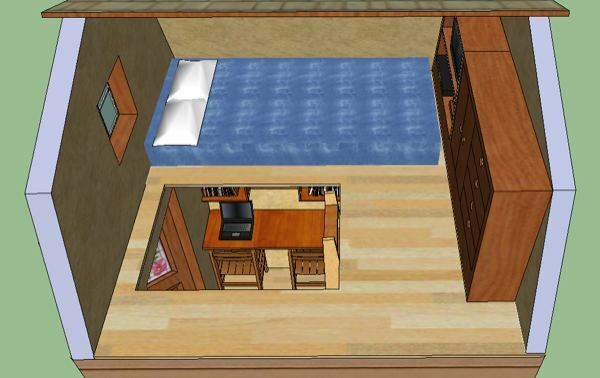 It has just a 64-square-feet footprint but boasts an upstairs sleeping loft with about 4 feet of head space in there. Above is a shot of the floor plan from above (not including the sleeping loft of course). The shower base is 3×3 and you can use either a standard flush toilet or a composting one. Plenty of storage there too as you can see. Let’s head to the kitchen..
LaMar did an excellent job of fitting everything that’s necessary to enjoy all the amenities of a kitchen here. Microwave, refrigerator and stovetop along with enough storage for food and cooking. Enjoy an aerial view below. Opposite of the kitchen is an area you can use for eating, working, reading, and studying with enough shelf space for your books and other belongings too. Actually there’s just enough room for two. Below you can see what the upstairs sleeping loft is like. As you see he includes storage compartments in the design for up there as well so you can keep all of your stuff out of sight. Here’s the same area with another angle so you can see where you can maybe put your TV, books, and a good shot of the cabinets. Below is what you’d see looking down from the loft. Beautiful design work LaMar! LaMar published a post with these photos, his thoughts, and more information on how he’d build this cabin. Check that page out right here. If you want more posts like this in your email join our free tiny house newsletter and receive 6 framing plans free! If you enjoyed LaMar’s 8×8 tiny house design “Like” and share if you want then let us know what you liked best about it in the comments at the bottom. Thanks! I love it- great work. I’m also thrilled that so many people not only contributed, but spent so much time and thought on this. Alex, we should definitely do another contest, and perhaps with the layout of the new cabin we built at the workshop- a mere 5.5′ by 8’….photos to come…. Sounds good to me Deek! Thanks! Even though the 8 by 8 contest ended, may I submit a design? Hi Daniel, sure! My email is tinyhousetalk [at] gmail [dot] com if you just want to send everything there. I’d hate living in this as set up. Where does one sit comfortably? Have company? Living up stairs would be unbearably hot in the south and lonely. The bathroom is huge for such a small space. The shower/toilet should be in a 2.5’x2.5′ space. You can’t afford to waste so much space that is used so little of the time. The mirowave should be hung from the ceiling or wall not wasting counter space. 8’x 8′ is a hard space to use eff and this one doesn’t do it well. For about the same materials a 6’x12′ is much easier to make work. Maybe have a contest in that size. Such can sleep 2-4, party 7 comfortably and far more confortable, social and practical than most any 8’x8′ I’ve seen or can think of. 8′ wide even longer isn’t that great either. Either 6-7’wide and longer or 10-12′ wide are so much more flexible in what you can put in and not waste space. It’s also better for using as a trailer tiny house as more narrow and 7′ or so high has much less aero drag for more easy, higher mileage towing by a smaller vehicle. Shouldn’t the goal be a better tiny house than an arbitray number based on max legal road trailer width without a cheap, permit that lets you tow up to 12′ for a yr? This design was for an 8×8 contest so the parameters were already set. I have many plans for larger structures including an 8×20 house on wheels on my website and a new 10×20 transformer cabin. Not everyone is looking for house on wheels plans and I design more cabins for guest house, vacation and permanent housing. The thing about 8’x8′, is that it uses the plywood so effectively, unlike a 6’x12′, which would require more wood, with more waste left over. I thin LaMar did a great job, and jerryd is just an armchair critic. As someone recently finishing a 12×12′ cabin and doing a 6’x22′ now and over 100 tiny homes before hardly makes me an armchair critic. If you read it was a 64sq’ contest to make the most liveable one in that space. Or do you think a 6×12′ comfortable sitting 6-8, sleeping 4 with a generous kitchen, bath on 1 floor is worse use of 64sq’ of space than Lamar’s 2 table chairs, etc and a loft bed? Plus in the middle of the night you don’t have to climb down a ladder. Using ply effectively doesn’t count if the room inside it is hard to use. And 8×8 is very hard. Lamar did a good job with it but it’s limitations shows. My designs have little scrap left either and no more of wood, etc compared to Lamar’s 1.5 floor design. I think the contest was for an 8’x8′ design. I agree that 6’x12 would be more livable. It would also be 72 sq. 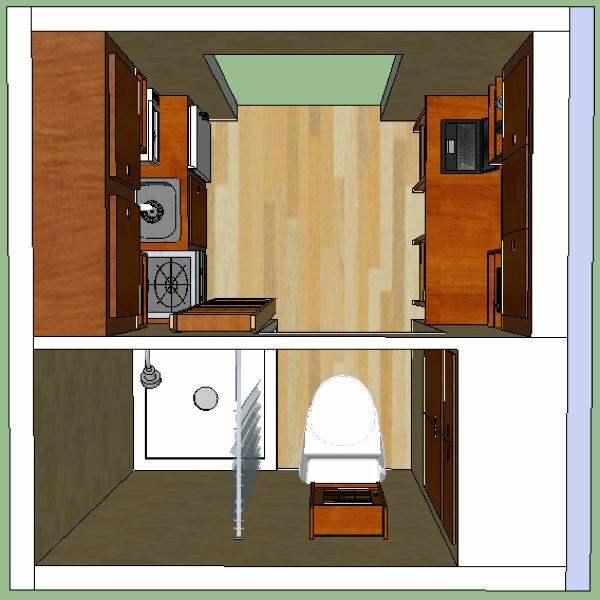 ft. You’d have to go to 6’x 10 1/2′ to stay within 64 sq.’ ft. Also, I think the three foot bathroom is a must. I don’t think I could stand anything less. I would put a couple of soft chairs and a small table where the desk is, extend the loft so I could enter the bed from the foot of it, and it would be just enough for two people. Now this is a great 8×8 design! It has all the essentials and some of the luxuries which is quite a feat in that space. I LOVE THIS DESIGN!!! I live in a city with 350 days of sun a year and beautiful views. I can imagine this as a great little cottage in the dessert with skylights in the roof. LaMar has done an impressive job. I like the cabinetry in the sleeping loft. My concern is only with windows. There doesn’t seem to be one in the bathroom–where’s its lighting please? And the sleeping loft seems to have only one window–if I’m wrong, I apologize. I’m the type of person that must have windows East — South — West to get enough light to save electricity & give me my daily dose of Vitamin D.
Thanks- I added a window to the final design after I took the pics. I also put in more built in cabinets. This can be adapted many ways and the window, door and furniture placement is optional and could be changed to fit any needs. I would definitely add more windows, and I’d eliminate the desk in favor of a couple of comfy chairs with a small table between them. But that’s just me. I am actualy thinking of building something just like this in my yard, as I live in a municipality which requires a permit on only 100 sq. ft., and that includes roof overhang! I’ll admit it, I don’t mind to live in that tiny house to save all $ on land tax. In that house that all I need. With little modify… Roof ceiling raise little bit higher than 4 ft. I don’t mind low as 5 ft than 4ft because I’m 6’7″ that would mean I had to crawl in 4ft. at 5ft or 5’6″ I just need to ducking. Also I would have put solar on roof on one side and other one window to get more light into house at daytime. This is fantastic. It has all the comforts of simple living with a few added luxuries. The placement of the bed is great because it allows people to stretch out up there and relax. I think I’d want something slightly larger than 8×8 but this is a great utilization of space and materials. If I were to ever build a backyard retreat, this is the design I would use. Nice job, Lamar! I think you used the space very effectively. I’ve also looked at the other plans in the contest, and in my opinion, yours is the most liveable. Expand this baby to 8′ x 12′ to add a living area, and its darn near perfect. Great work! I really love the cabinets that you reach with the ladder readily available. Nice touch. I too would like the trap door sort of style on the loft hole, for safety sake. Overall great job LaMar! Ty for sharing it with us Alex. Happy Trails and God bless all of you. Next post: Tiny House on an Army Truck?